Maximum protection for your family members. Home security is important to keep your family and your house safe from crime & burglar break-in. Roller shutter is applicable for home. Roller shutter powered by Hightex® Dynamic provide peace of mind and added measure of security. Indoor based roller shutter can be installed at staircase entrance as “Second Layer Protection” to keep unwanted intruders from attacking your family members. Whereas for outdoor based roller shutter, it is usually install for garage. 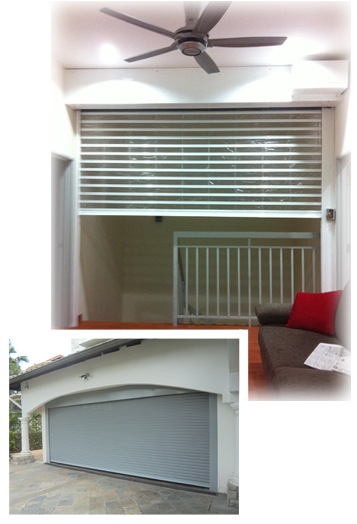 For home usage, motorized roller shutter will be more convenient for home owner. Uninterrupted Power Supplier (UPS) or back-up battery can be installed. During power failure, the backup battery automatically steps in to power the operator to function normally.